With a sigh of relief, Tara the tech bid farewell to their last patient of the day and began her end-of-day routine. After all was said and done, she turned to the washing machine blindly stuffing in a load of scrubs and towels. Without a second thought, she poured the detergent in, closed the lid, and turned on the washer. “Psst, hey Washing Machine, are you up?” whispered the Dryer. “What’s up Dryer?” responded the Washing Machine. “I was just wondering, are there any stains that keep you up at night?” asked the Dryer. “That’s a loaded question Dryer, but pretty much every stain keeps me up at night.” the Washing Machine responded. “I have to admit, it’s a tough job. All you have to do is dry, while I am expected to get every kind of stain out.” said the Washing Machine. “If they only knew how to pre-treat their scrubs and towels, they would be making my job so much easier.” the Washing Machine said with a sigh. Help the Washing Machine remove stains easier – try some of the pre-treatment tips shown in the guide below. 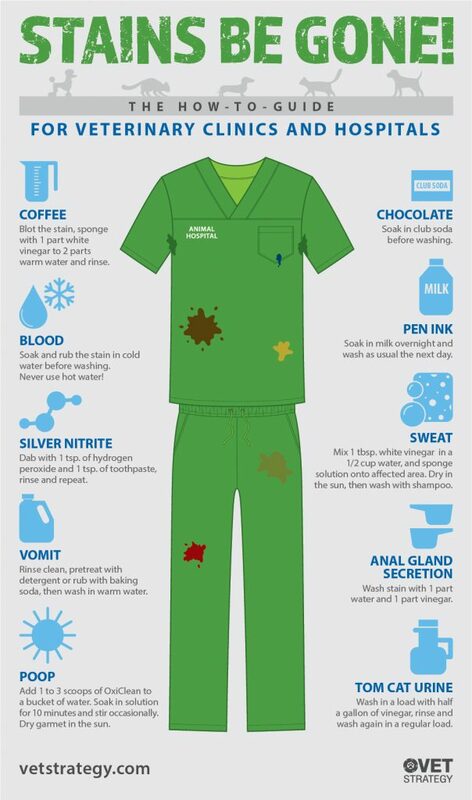 It may help you and your hospital team deal with some of those nasty stains so your scrubs and lab coats can continue looking spotless and fresh.